One of my very best tricks! Watch the video! 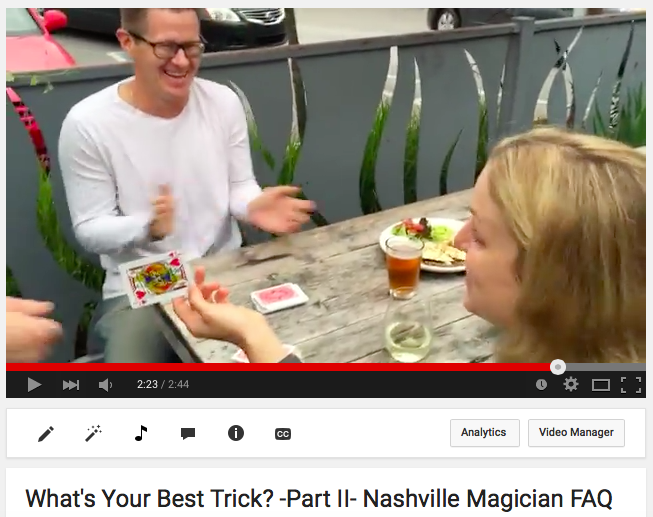 Last week I addressed a frequently asked question, “What’s Your Best Trick?” and included a video of a trick that delivers a consistent joyful exuberant reaction. This week I would like to share another trick that has a powerful impact. Instead of reacting with laughter and excitement, this trick causes people to question their core beliefs in life. Well, maybe I’m going too far, rather, this trick puts people in a state of pondering astonishment. This is a great place to be, because as adults most of us have lost touch with the emotion of feeling astonished. And in my opinion this trick is better for adults. There are several qualities I look for when selecting tricks to perform. One quality I look for is a trick that is of a quality that will result in getting me booked to be the magician to provide entertainment for your party in Nashville or wherever you have your party. This trick meets that quality standard. After seeing this trick people have told me it is the best card trick they have ever seen. Not everyone, but there have been several. I actually don’t perform many card tricks, and I’m very picky about the ones I do perform. This is one I will continue to perform now and through my whole career. Have you seen me perform this trick? Please post a comment about your experience from seeing it in person or from seeing it in the video. ← FAQ What’s Your Best Trick?